I've been hiking at Bukit Tabuh quite few times. But it's the best place for hiking (at least for me!) place for me. I just love hiking here since it's not like any other hill i've done. This is where you are not only have to climb up but also rock-climb. This time around, the usual WonderGurls team members are missing 2 of their members since Ida and Izan hhave sthing else to do. That left Dell and me. The other experienced climber to Tabuh is Aiman. 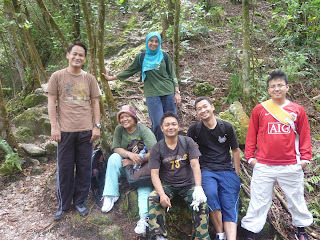 The rest are new climbers, Hafiz, Ridhuan, Kuzi and Kak Hanim. Eventho they are beginners, they did great!! We started at about 830am. We managed to had breakfast before started our climb. There are 11 checkpoints here. The hardest will be after checkpoint 8. So, for those who has never been there and plans to go there, put on ur hiking shoes and pack a bottle of drink AND a glove. it will come in handy. Wud love to upload more pix but due to network error, cudn't do it.